The Mercedes AMG GT 4-Door Coupe is a 4-door, 5 or 4 seater fastback coupe produced by Mercedes AMG. The car was recently unveiled at the 2018 Geneva International Motor Show in Switzerland. This is the first sedan hatchback in the famous Mercedes AMG GT series. The sports car AMG GT was originally revealed at the Paris Motor Show in October 2014. This series features many great sports car and now gets its very first sedan. The Mercedes AMG GT 4-Door Coupe is a mixture of impressive sports car performance and elegant style that fits perfectly in one's daily life. The car has mostly the same performance (the top level has more power than the original AMG GT). The car is available in three versions: AMG GT 53, AMG GT 63 and the top level AMG GT 63S. Even before its release, the new Mercedes AMG GT 4-Door Coupe is already a favourite among many car enthusiasts. Mercedes always makes sure to deliver the best automobile on the market and once again, a masterpiece is created. This car will have the Porsche Panamera and Audi RS7 as ultimate rival. 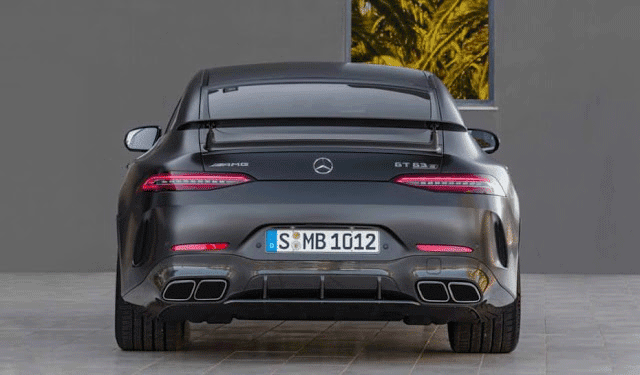 At first glance itself, you know that you are looking at an AMG GT car. Mercedes upgraded the looks to make it more beautiful and elegant while at the same time, preserving the original AMG GT style. This car is a perfect combination of sports and elegant design. This statement makes the car suitable for both weekdays and weekends. 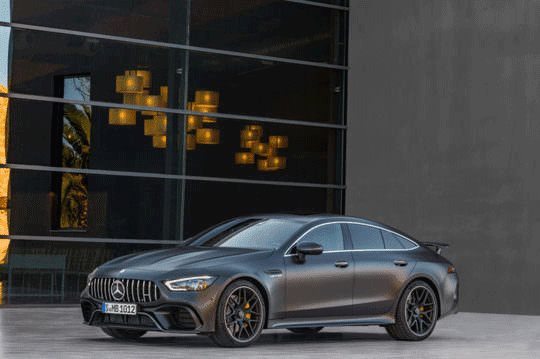 What has remained unchanged in the new Mercedes AMG GT 4-Door Coupe are the typical AMG radiator trim, long hood, large air vents, sporty Multibeam LED headlights and adjustable or fixed rear spoiler. All the AMG GT models feature active aerodynamics. On the base model, that is the AMG GT 53, you get an automatic adjustable rear spoiler. The latter will flatten itself to a low-drag position if you are driving in a straight line and once, the car detects cornering, the spoiler will move itself to a high-downforce setting. If you go for the AMG GT 63 or AMG GT 63S, you can get an optional aerodynamic package that will replace the active spoiler with a fixed, manually-adjustable track-oriented spoiler. 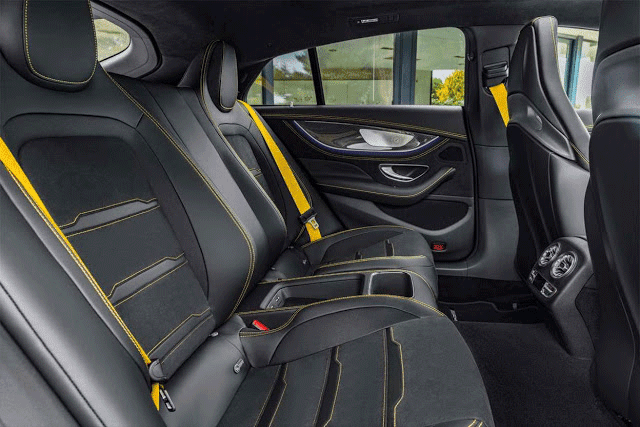 Inside the Mercedes AMG GT 4-Door Coupe, you get the best materials just like any other Mercedes. The car has all the luxury and all the latest technologies that you expect a car to have. Finally a sports car from Mercedes which can bring your whole family to the track. The Mercedes AMG GT 4-Door Coupe uses the new Mercedes instrument panel layout. That is, a 12.3-inch screen extends from the driver's side to the centre of the dashboard. This massive screen is replacing the traditional gauge cluster and centre infotainment system. Mercedes takes a step further in making their cabins more futuristic. The time when you would find labelled buttons on the centre console and the steering wheel is long gone. Now, Mercedes has replaced them with new "display buttons". Literally, there are tiny touch screens instead of buttons. The Mercedes AMG GT 4-Door Coupe comes with either 4 or 5 seats. But the car comes equipped with only 4 seats in the United States. Instead of a middle seat, there is a centre display in the console for the rear passengers where they can control the media, navigation and climate controls among many. The Mercedes AMG GT 4-Door Coupe is packed with a lot of power, even the entry-level model is above average in terms of power and acceleration. There are three versions of the new car. The base model AMG GT 53 comes with a 3.0L turbocharged straight six cylinders and a mild hybrid system that provides additional electric "boost". The engine makes 429 hp and this makes the car sprint from 0 to 62 mph in 4.4s. The top speed of this model, as well as the amount of torque is not yet available. But according to me, the top speed will be somewhere around 185 mph. The next option on the list is the AMG GT 63. This one has a 4.0L twin-turbo (BiTurbo) V8 that produces 577 hp and 590 lb-ft of torque. This one has a 0 to 62 mph time of 3.4s. 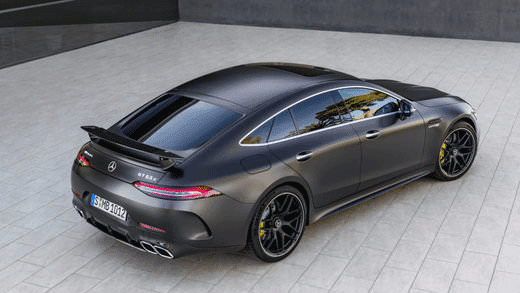 The AMG GT 63 can achieve a top speed of 193 mph (311 km/h). Then comes the top level of the AMG GT 4-Door series. The AMG GT 63S features the same engine as the AMG GT 63 but here is the crazy part. This one makes a whopping 630 hp and 664 lb-ft of torque. That is enough to take the two-tonne four-door hatchback from 0 to 62 mph in just 3.2s. 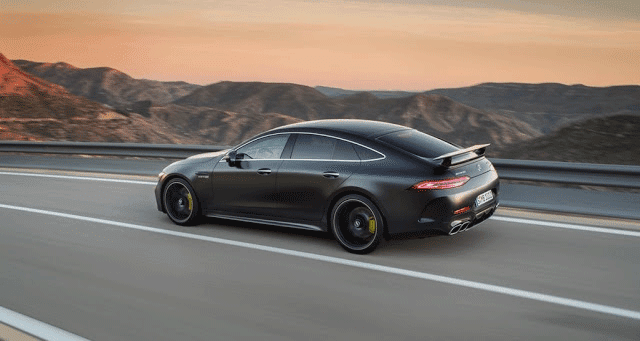 The AMG GT 63S recorded a top speed of 196 mph (315 km/h). All models are equipped with a nine-speed automatic transmission. The AMG GT 63 and the AMG GT 63S comes with a Drift Mode so that you can have double fun and you can finally take your family sideways. The AMG GT 4-Door Coupe has an initial economy figure claiming both versions are capable of getting 25 mpg. The official price will be revealed when the car goes on sale in mid-2018. The price of the Mercedes AMG GT 4-Door Coupe should be around the price of the Porsche Panamera. 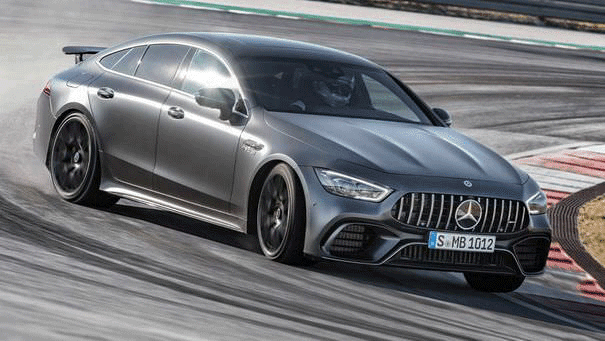 The entry-level AMG GT 53 will set you back around $113,600 while the top level AMG GT 63S could go for more than $177,500. The Mercedes AMG GT 53 will arrive later than the AMG GT 63 versions. The Mercedes AMG GT 4-Door Coupe looks very promising as the amount of love the car is getting keeps on increasing day by day. This car is for the market that basically loves supercars but wants to bring their whole family alongside. It is for those that want to own a supercar but also need a daily driver at the same time. And believe me, this market is increasing rapidly nowadays. For the time being, all we can do is to wait for the car to release and see how well of a reputation this car can get.